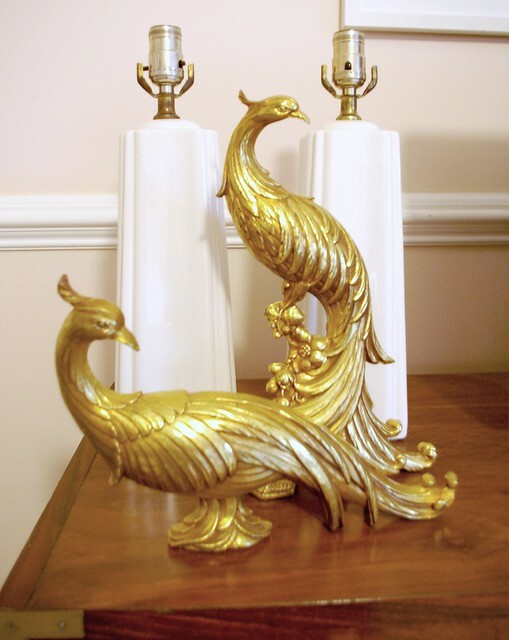 I posted about these Art Deco style pieces over at our FOUND blog. Check it out here! I have that same bird in my bathroom! I love it! Holy smokes. My mother once owned birds like that. I can't believe I am seeing this. It makes me a bit sad because she also once owned these lucite dining chairs that were a smokey grey tint. SHe could have made a fortune if she saved everything. What a very lovely bird home decor! Oh wow, I just bought the taller bird at a thrift store the other day! Hey Brynn - just found your blog via google search for peacocks. Putting a link from my blog to yours for my peacock post today. Hope that is good! Undoubtedly will be back!!! Love the birds but love those lamps too! Beautiful with a black shade piped in gold! Great finds.